Urban Answers has written widely on the topic of cross national lesson drawing and is happy to provide ready access to some of these recent articles. 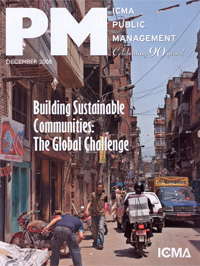 The cover story of the December 2008 issue of the US magazine, Public Management, is designed to assist US city and county managers develop a more international approach to US city leadership and urban management. Written by Robin Hambleton and Jill Simone Gross the article, titled Local Management in a Global Era, examines urban trends and sets out five emerging lessons from global research on cities. 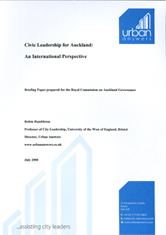 The Royal Commission on Auckland Governance commissioned Urban Answers to prepare a Briefing Paper on ‘Civic Leadership for Auckland: An International Perspective’. Published in July 2008 this report puts forward a new conceptual framework for understanding civic leadership. It adopts a global perspective and examines the changing context for civic leadership as well as the shift from ‘government’ to ‘governance’. Based on a review of the literature and as well as current challenges facing metropolitan areas it puts forwards ‘pointers’ for civic leadership in the Auckland city region. Planning is the professional weekly for all practicing planners in the UK. 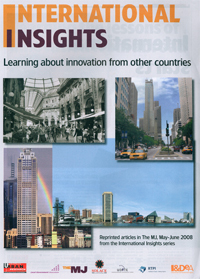 It is the professional magazine of the Royal Town Planning Institute (RTPI). This article examines the spectacular urban development of Shanghai, China and asks questions about whether the rapid expansion of the city is leading to harmonious planning as advocated by President Hu Jintao. The involvement of planning students from the University of Tongji in designing the World Expo 2010 site is a bold innovation that could provide lessons for planning schools elsewhere in the world. This article discusses the nature of the cross national lesson drawing process. It distinguishes informal from formal approaches and describes three ‘levels’ of transfer: 1) Technical measures, 2) Policy exchange, and 3) Institutional transfer. Examples are used to illustrate the argument. This article examines the way transatlantic dialogue in relation to urban policy, urban governance and city planning has gathered pace over the years. It suggests that debates about ‘new urbanism’ in the US resemble similar debates in the UK and that there is much to be gained from strengthening transatlantic dialogue in relation to city planning and urban design. 4) The implications of these developments for cross-national policy transfer. Presented to the ACSP/AESOP Conference in Chicago, USA in July 2008 this paper discusses the changing context for civic leadership and sets out a case for strengthening place-based leadership.